Yarn and Fiber Happenings: Sprinkled with Pixie Dust and Beautiful Buttons! Sprinkled with Pixie Dust and Beautiful Buttons! 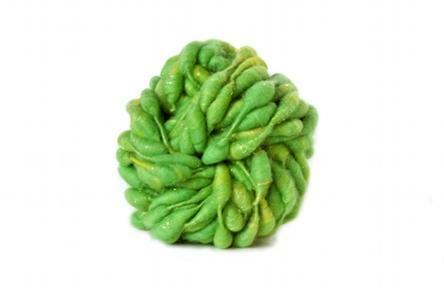 Just arrived - Knit Collage Yarns Handspun Pixie Dust yarn. 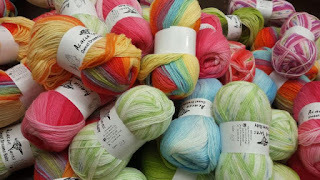 Available in a variety of colors, Knit Collage Pixie Dust yarn is gorgeous and fun! Beautiful colors and fibers sweep you away with thick and thin moments on size US 19 needles. Pixie Dust is sprinkled with color and beauty... cast on today and wear tonight! Have fun with this exquisite yarn! The designer of Bonnie Maresh buttons came by the other day with hand-made beautiful buttons for your favorite garments. Bonnie adds a little of herself to every button and they are as perfect and wonderful as she is!We have a vast assortment of gorgeous glass buttons in many sizes adorning our shelves! These buttons are perfect for hats that require a single beautiful button as well as sweaters that need a row of gorgeous! Bonnie Maresh Buttons can glow from within, bring lots of sparkle or add just a touch of color - there is a button for everyone! Did I mention these buttons are from a glass studio here in New England? And, if you are looking for other types of buttons, we have them as well... over 500 tubes of buttons are now available to fulfill your button needs... check them out!